The word “one” appears seven times in Ephesians 4:4–6. 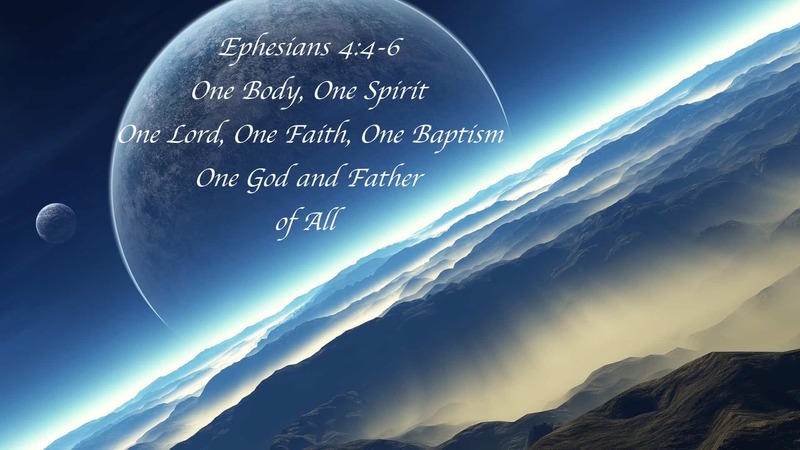 Oneness and unity are important themes in Ephesians and in Paul’s writings. Paul constantly preached about unity and prayed for unity among Church members (Romans 12:5; 1 Corinthians 1:10; 2 Corinthians 13:11). Most churches today are grouped (classified) by “denominations,” which came about from men having various disagreements over the interpretation of the Word of God. This is troubling because Jesus put his apostles in charge of the Church (Mat 16:18-19; John 17:20) and they preached the same unity of doctrine which Jesus had given them (John 7:16-17; 2John 9-10). The gospel message, which they were commanded to take to all the world, was the same to everyone everywhere. People were not taught different gospels and then given a choice. There was only one gospel plan for all (Romans 1:16; Galatians 1:7-8). Concerning the New Testament, there are some who say that the only Lord in Jesus was the Lord God. In other words, Jesus isn’t Lord within himself, but only on the basis that God, being the only Lord, entered him. However, according to scripture, this position is actually a denial that it was God who made Jesus Lord (1Tim 1:1, Acts 2:36) (See also: Acts 20:21; Rom 1:3, 5:1, 11, 21). Note: One must understand the differences between the Hebrew and Greek translation/transliteration of our English word Lord and how it is used in the Bible (KJV). The LORD God (Yahweh Elohim) possessed the title of Lord (Adonai) from ancient times. Adonai is applied exclusively to Yahweh (the LORD God). The title applied to the Messiah in Psalms 110:1 is “Adoni” (my lord). While Adonai (Lord) is exclusively God’s title, Adoni (my lord) is never used of God. It is always used in reference to a human or angel. The Hebrew language is much more thorough than the Greek language. There is only one main word used for ‘lord’ in Greek and that is “kurios” [Strong’s G2962]. The New Testament uses the title Lord (kurios) interchangeably, sometimes referring to the One God, other times referring to Christ. However, to the Greek-speaking Jewish Christians, the context would show which ‘lord’ is being referred to, whether it be God, man or angel. It was God who exalted Jesus to this position as Lord over the church. Jesus is Lord. Jesus is our adon (lord) according to Psalms 110:1, Acts 2:32-36. He is not Adonai (Lord). God alone is Adonai. Jesus was not made Adonai (deity title), but Adon (non-deity title). The references to Psalms 110:1 in the N.T. affirm the Father is the Supreme Lord God and the Messiah is my lord. The Majesty on high, of which Jesus is sat down at the right hand of God Himself. God, is his Majesty, Jesus is a prince of his Majesty. (Acts 5:31) Him hath God exalted with his right hand [to be] a Prince and a Saviour, for to give repentance to Israel, and forgiveness of sins. (Philippians 2:9) Wherefore God also hath highly exalted him and given him a name which is above every name: 11 And that every tongue should confess that Jesus Christ [is] Lord, to the glory of God the Father. One faith is a matter of what it is that you believe in. Whether people obey or disobey God is a matter of their regard or disregard for the word of God. The only possible way for us to be united as Christians is to follow the plan of God as contained in the Bible, that is speaking where the Bible speaks and by remaining silent where the Bible is silent (1 Peter 4:11). No one in the Bible was ever asked, “Are you Protestant or Catholic?” for such did not exist. No one asked, “To which faith do you belong?” for there was only one faith (Ephesians. 4:5). This “one faith” is the message of the gospel or the Word of God. The “one faith” is in Jesus (Ephesians 4:15; Titus 1:4; 2Peter 1:1). In other words, this “one faith” is the very heart of the gospel, for it is the power of God to them that believe (Romans 1:16-17). This faith proclaims what Jesus has done for humanity. It reveals both God’s grace and Jesus sacrifice. (Romans 10:8-9 NKJV) But what does it say? “The word is near you; in your mouth and in your heart” (that is, the word of faith which we preach): 9that if you confess with your mouth the Lord Jesus and believe in your heart that God raised him from the dead, you will be saved. This phrase (into) indicates under the leadership of an individual (or group), an idea, movement or purpose (Acts 19:3; Gal 3:27; Rom 6:3-4). The baptism spoken of in this passage (Ephesians 4:5) is in reference to those individuals who are said to have been baptized into Christ (Gal 3:27; Rom 6:3-4) our Lord/Master (Acts 20:21; Rom 1:3, 5:1, 11, 21) which is a phrase reflective of only those who are obedient followers of Christ (John 14:15-17, 21; 1John 3:22-24 NKJV) (See also: Verses Where “He” & “Him” Should Be Referred To As “It”.). When John (the forerunner of Jesus) was baptizing in the River Jordan, this is what he told people about Jesus: “I indeed baptize you with water unto repentance, but He who is coming after me is mightier than I, whose sandals I am not worthy to carry. He will baptize you with the Holy Spirit and fire” (Matthew 3:11 NKJV). John baptized in water, but Jesus did not baptize in water instead He was to baptize with “the Holy Spirit and fire.” Jesus refers to the baptism with the Holy Spirit when He told the apostles to wait in the city of Jerusalem for power from on high: “for John truly baptized with water, but you shall be baptized with the Holy Spirit not many days from now.” (Acts 1:5 NKJV). The apostle Peter refers to this promise later, when he preached to the household of Cornelius, “And as I began to speak, the Holy Spirit fell upon them, as upon us at the beginning. 16 Then I remembered the word of the Lord, how He said, ‘John indeed baptized with water, but you shall be baptized with the Holy Spirit.” (Acts 11:15-16 NKJV). Note: These are the only two cases recorded in Scripture of the baptism with the Holy Spirit. Only Christ could baptize with the Holy Spirit. No other man had authority to do that. Jesus sent his apostles out and the apostles continued baptizing people in the water, including Jesus (Acts 8:36 10:47; I Peter 3:20,21). Note: to be baptized with (is to be filled with or receive) the Holy Ghost, which was a promise, not a command (Acts 2:38). However, the baptism administered by the apostles was a command (Acts 10:47). The baptism with the Holy Spirit was not for all people, but only those who were obedient (Acts 5:32). You can be baptized and still not receive the Holy Ghost. The act of water baptism can be performed but all of the Acts 2:38 conditions must be met in order to receive the Holy Ghost. The purpose of this “one baptism” (the baptism of Christ), which (Ephesians 4:5) speaks of, was to empower people, as Jesus told the apostles, “Ye shall receive power when the Holy Spirit is come upon you” (Acts 1:8 NKJV). The outpouring of the Holy Ghost, on that day of Pentecost, came as a result of what Christ accomplished, through the baptism of Christ (Luke 3:21-22). This “one baptism” puts you as one with Christ (“into Jesus Christ” Romans 6:3), it is when we are in this position (condition) in life that it saves us from our past sins, as “unto the remission of sins” (Acts 2:38) and “into the death of Christ” (Romans 6:3). When one obeys Christ today, he is considered baptized into Christ because we have “earnestly” repented of our sins, baptized in water (normally, but not always in this order) we receive the Holy Ghost (have been baptized with the Holy Ghost), as is the promise, thus we are considered saved (Mark 16:16). Of the thirty-nine books listed in the Old Testament, there is not one word about three Gods in one or one God in three parts. Never do we hear of three Gods, but one (Deut 4:35, Isa 45:5-6, 18, 22). In the writings of Psalms and Proverbs, and some other books, there is a reference to the Son of God, but never to God the Son.